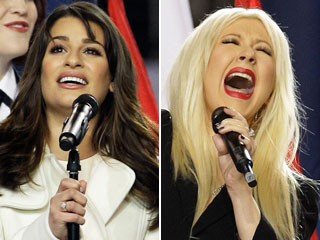 Lea Vs. Christina: Who Sang It Best? Super Bowl XLV kicked off with dueling divas Lea Michele and Christina Aguilera’s respective performances of America The Beautiful and our national anthem, The Star Spangled Banner. We’re gay men here at Unicorn Booty, which means we are physically unable, not to mention violently allergic to not judging their performances against one another. So little unicorns, we’re asking you to pick. Who sang it best? Was it the good girl from Glee or Xtina (If you’re nasty) – Which gal’s patriotism was music to your ears?